To most home owners, outdoor lighting means a decorative wall sconce by the front door, a few lights along the walkway and perhaps floodlights for security. Exterior lighting can do much more. It can make even a modest property look very attractive at night, increasing the home’s visual appeal and making it more salable when the time comes to put it on the market. Outdoor lighting can also make a yard a more enjoyable place to spend time. And surprisingly, exterior lights even can make the interior of a home seem larger and more pleasant. When there’s little or no exterior lighting, windows become black mirrors at night for people inside, making the interior seem smaller. 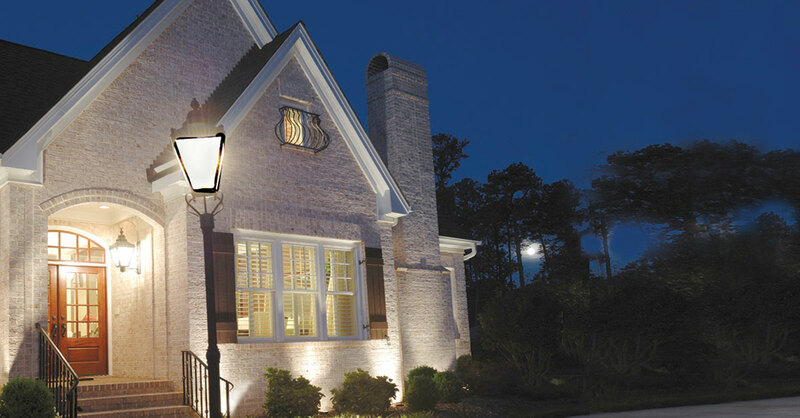 Outdoor lighting can make your home feel safer, too, by deterring burglars. All of this can be accomplished without hiring an electrician. A handy home owner can keep costs as low as a few hundred dollars, though lighting will last a lot longer if you invest a bit more in well-made components. Doorway lighting. Most houses already have one or two fixtures mounted beside the front door. Expert strategy: Many home owners put uncomfortably bright bulbs inside these fixtures. Instead, install 25- or 40-watt-equivalent bulbs to illuminate entryways while minimizing harsh glare and shadows. Long-lasting, energy-efficient LED bulbs are now available in a wider variety of traditional shapes, including the flame-tip shapes so common in outdoor fixtures. With an LED bulb, you can get the light output of an old-fashioned 25- to 40-watt incandescent bulb while consuming only four to six watts of power. If you are adding or replacing doorway fixtures, don’t be afraid to “buy big.” Fixtures that seem substantial in the store often look too small when actually hung. Consider borrowing a few samples from your local lighting store in two different sizes to see which one looks right from the street. Uplighting is positioned on or in the ground and pointed up to dramatically illuminate lawn features such as trees, shrubs or gazebos. Uplights that are recessed into the ground are known as well lights. Choose directional lights with hoods or shades so that you don’t see distractingly bright “hot spots” when you look out the window. Expert strategy: Use uplights to highlight the yard’s most neatly pruned trees and shrubs, giving them a sculptural quality. Position three uplights around a tree or shrub that’s in the middle of the yard. Use one or two lights if the tree or shrub is located along a fence or next to the home. Favor aboveground uplights over well lights. They’re easier to reposition if a tree being illuminated grows, and they tend to last longer. Position aboveground uplights behind small plants or shrubs, ideally in mulch beds, to keep them out of view. Uplights and other landscape lighting can be wired in series, with each light connected to another light in the vicinity and ultimately wired into a transformer either inside or outside your home that is plugged into an outlet (see “Power Options”). Silhouetting — also known as backlighting — is a dramatic uplighting technique appropriate when shrubs or trees with strong shapes, such as magnolias or evergreens, are located in front of a wall or fence. In this case, a row of uplights is aimed to illuminate the wall or fence behind these trees or shrubs. Expert strategy: To achieve the desired “wall-washing” effect, the distance between uplights generally should be equal to the distance between the uplights and the wall. Path lighting makes walking on walkways safer after dark. But handled improperly, path lights can make a yard look like an airport runway. Expert strategy: Vary the side of the walkway that path lights are placed on, and vary the distance between lights. This creates visual interest and breaks up the runway effect. For safety, place a path light at any point in the walkway where there is a step or change in surface. Select opaque mushroom-type or directional path lights that project light only downward. These provide safety without calling excessive attention to themselves. Solar-powered path lights are not ideal. They often are underpowered, particularly if trees or the house blocks the sun part of the day. However, solar path lights are easy to install and free to operate. If you use them, choose those that project the light only downward. Downlighting is the best way to light outdoor activity areas such as dining tables or cooking or seating areas. Downlights can be mounted on eaves, trellises, gazebos or the branches of mature trees. A downlight cord can be run down the side of a tree that is viewed least often and held in place by large galvanized staples. Expert strategy: Hang lights from trees using adjustable straps specifically designed for this purpose. If you must screw downlights to trees, use galvanized screws, which are less likely than other screws to harm the trees. Moonlighting is a special down-=lighting technique. Downlights are hung on tree branches above the lowest branches so that the light filters through the leaves of those lowest branches, creating a dappled, natural-looking light-and-shadow effect. Other lights might be mounted in these trees and pointed up to highlight the foliage canopy. Expert strategy: Mount these lights perhaps 10 to 12 feet up, where they are above the lowest branches but still easy to reach with a standard ladder. Home centers typically sell basic outdoor lighting kits with six to 12 lights for as little as $90 to $125, but these are low-quality fixtures that could start to fail in as little as two or three years, especially in harsh climates. Well-made outdoor lighting fixtures can cost $100 or more apiece, but they can provide 20 years of service. Halogen bulbs traditionally have been used in landscape lighting, but recent advances in LED bulbs and fixtures make LEDs the best alternative in almost every case. LED fixtures are comparable in cost to the old halogens, and they’re more energy efficient, more reliable in cold weather and can last more than 10 times as long. For the most pleasing effect, look for LED bulbs or fixtures with a “light temperature” in the 2700° Kelvin to 3000° Kelvin range. This tells you the color of the light. A 2700° temperature is the color of traditional incandescent lighting at full brightness, and 3000° is a bit whiter—it’s the color of halogen light at full brightness. Also look for bulbs or fixtures that have a CRI (color rendering index) of 90 or higher. This tells you how well the light will render various colors in relation to each other—the higher the number, the more “natural” the effect. Fluorescent outdoor lights usually are best avoided. They often create light of an unpleasant color and fail in cold weather. Good sources of outdoor lighting fixtures…FX Luminaire and B-K Lighting offer a range of very well-made (although expensive) landscape lighting fixtures, including pathway lights. Hinkley Lighting offers solid-quality landscape fixtures and pathway lights at generally lower prices. Hubbardton Forge and Hans Duus Blacksmith offer a range of beautiful hand-forged American-made fixtures for walls, ceilings, eaves, lampposts and other mounting locations, although they can be pricey. Murray Feiss and Hinkley make attractive fixtures for many locations at more accessible prices. Outdoor lighting is available in 120-volt “line voltage” or 12-volt “low-voltage” systems. The 12-volt systems are the best choice for most home owners because they usually can be installed without hiring an electrician and without adding additional circuits to your electrical panel or following ultrastrict building codes. They also consume less electricity than 120-volt systems. The cords typically are buried, but if you use a 12-volt system, they don’t pose a safety risk and need not be buried very deep. A 12-volt system will require a transformer, which will cost from $150 for a typical home-center unit to more than $500 for a top-of-the-line unit such as one from Semper Fi Power Supply that typically provides decades of service. Most transformers are about the size of gallon milk jugs. They can be placed in garages or basements, attached to exterior walls or positioned on short posts in the yard. Lights positioned more than 75 feet from a transformer sometimes are dimmer than those located closer. Installing multiple transformers is one way to solve this problem.